I am frequently asked what Crossing Delaware is and where I got the name. My whole life I’ve been creative and constantly inspired by my surroundings at the most unexpected times. This is my story. 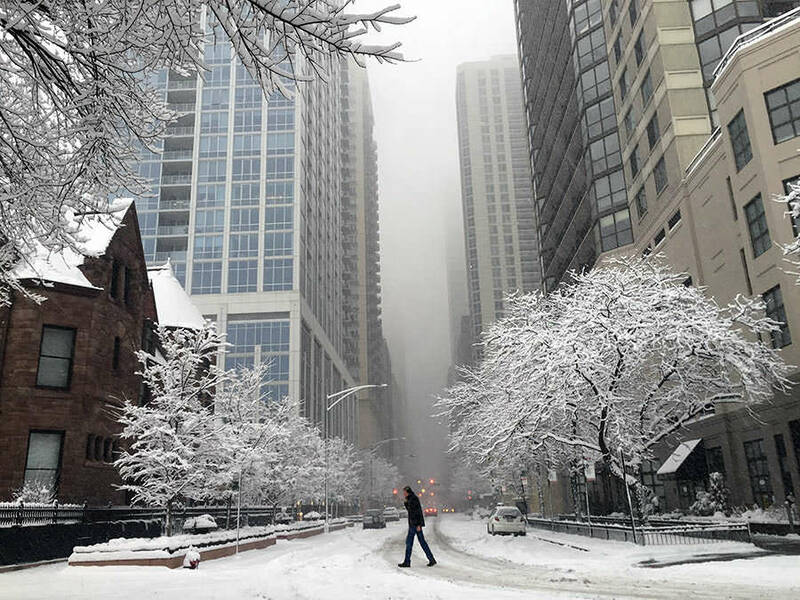 In February of 2015, I spontaneously ran out into the streets of Chicago on the coldest day of the year during a Winter blizzard. It was the middle of what had been called a Polar Vortex. My hands, feet and face were frozen. People were dodging into buildings to get out of the storm and cold as fast as they could. I was receiving strange looks since I was clearly running IN to the storm instead of towards a place of shelter. Then, I stopped and took a photo of a man as he was crossing the street I live on. This photo sat with me and in my photo library for a few months and I kept looking at it and sharing it with people. I have always had this passion and love for taking photos, as my friends and family know. Despite being an amateur, I did my best to take pictures of everything I saw and frame them as best I could. I love to tell stories with photos but this particular photo kept speaking to me. This man was Crossing Delaware. A few months went by and I decided to start running out to that same spot every day and taking photos. Rain or shine, I was out there taking photos of that same exact scene. I didn’t care what people were thinking or what looks I got, I was out there pretty much every morning around the same time taking my picture of Delaware. This was the birth of the Crossing Delaware series of photos. After about a week or two, I decided it was going to be a year-long project. I had no idea what I was going to do with these photo since I was sometimes taking more than 1 photo each day. Sometimes it was pouring rain in the morning and bright and sunny in the afternoon. Yep. There are definitely two photos on those days. As of the date this post is published, there are at least 282 photos over the course of approximately 7 months. Some are duplicates and will likely get trashed. At this rate I will have far more photos than there are days in a year. I am not entirely sure what will become of the photos when I’m done, but I know there will be a finished piece to share, prints for sale and some sort of time-lapse video to illustrate the process. What I’ve seen so far. In the past 7 months, I have seen thick green trees, heavy rainfall, hot sunny days, humid sweaty days, fog, the sun rising, blue skies with and without clouds, falling leaves, falling snow, melted snow, people walking to work, children on their way to school, people riding bicycles to work, taxi cabs, motorcycles, strollers, dog walkers, birds, squirrels, homeless citizens, shoppers, tourists, doormen, Christmas lights, protesters, firetrucks, ambulance, police cars, CTA buses, clogged gutters, construction workers, garbage trucks, and the list goes on and on each day I am out there. I look forward to the remaining 5 months of this journey, and sharing the progress with you. Check out our shop page to see all the photos I’m taking and posting on a regular basis. New items get added regularly and for the month of December, 20% of all proceeds will be donated to help fight homelessness and hunger in Chicago. Sign up for updates about new photos, articles and special offers! Thanks for your support, Marissa! It makes me happy to know people are enjoying the photos and the 365 project, specifically. Looking forward to continuing to post more and share more progress of this project with everyone. Everything is available in a variety of options and sizes. For questions & custom orders, please contact me with details. © 2019 Crossing Delaware · All Rights Reserved.